It is for these reasons that RBI has exploded in popularity in recent years. These days, there are a multitude of RBI products available – all with different scopes, functions, and design. For owner operators who are just entering the RBI game, the options might seem daunting. Which should I choose? 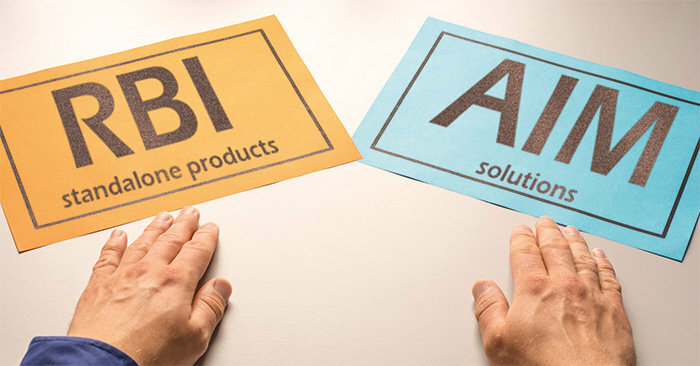 In fact, even for those who have been utilizing RBI in some capacity for quite awhile, the expanded plethora of RBI products poses new questions: How does my product stack up? Is it sufficient? Has the technology evolved beyond what I’m using? The onset of “standalone RBI” products evokes even further questioning. What exactly is a standalone, and how does it differ from an Asset Integrity Management (AIM) program? That, as they say, is the big question. A standalone RBI product refers to a software tool that exists solely for the purposes of RBI analysis and assessments. This differs from an AIM software, which will have all the same RBI functionality in addition to dozens of comprehensive modules for the full analysis, assessment and integrity management of all equipment. Although some standalone products might go so far as to include modules for static data, inspection results, inspection planning and scheduling, these modules are far less featured than the comprehensive modules available in a full AIM software. On paper, these features are great. In terms of utilizing RBI, the above functionality would be part of the ideal parcel to look for. To top it all off, the product itself is dedicated to RBI only. Therefore, it must be the best option if you are looking to incorporate risk based analysis into your asset management. Right? While the features included in a standalone software can be fantastic, they end there. The user is “making do” with a software that only provides a detailed asset summary, thus providing a high-level view of the equipment being managed. It would not be suitable for comprehensive asset integrity management of all assets, which would lead to the organization making two purchases: one for RBI, and one for the rest of the AIM. In fact, that’s likely why many of these standalone products include connectors to a third-party AIM software to begin with. It certainly wouldn’t be suitable for a large inspection group, where detailed and complex activities are being managed by individuals with varied security levels. A potential concern with some of these products is a lack of transparency. Some tend to provide only the final results of an assessment, with no indication as to how the Risk Level was arrived. They retain the data and if evaluation is required, the client must pay again. (Comparatively, with an AIM software, the client retains ownership of all data, can clearly see how the risk was arrived at, and can re-assess themselves at any time free of additional cost). Due to the limited features, users may need to keep inspection data, especially TML trending data, on spreadsheets, which would then average or calculate readings for transfer to the RBI software. Compare these factors with a comprehensive AIM software that includes a dedicated RBI module. First, all the same functionality is already included in the AIM software (but on a much more comprehensive and detailed level), as well as additional functionality significantly beyond the scope of the standalone option. This allows for more detailed assessment (as opposed to just high level) and transparent arrival of risk levels. There is simply no need to waste resources on a standalone RBI product, because it does not offer any additional functionality beyond that of an AIM program. On the flipside, an AIM program is well worth the resources as it will deliver everything that a standalone can plus exponentially more. Why, then, might someone choose a standalone software in the first place? Owners might mistakenly believe that the RBI software is all that they need, causing reluctance to invest in anything further. Another company might already be using a dated AIM software that doesn’t include RBI, unaware that a single program can do both or daunted by the perceived expense of such an upgrade. The fact is, cost should not be a deterrent in this decision because it’s cost effective to choose an AIM program with RBI built in. How so? The cost of an initial implementation (or upgrade) to better AIM software that includes RBI will only be more expensive as time goes on and the company has more data to implement. It’s inevitable for most organizations, because having two separate software programs for AIM and RBI creates information silos and increased IT management costs in terms of upgrades and maintenance. Thus, it is much more cost effective to jump on early. Dave Maguire is an asset integrity specialist with Metegrity Inc. He has spent over 10 years implementing the Visions Asset Integrity Management (AIM) software and instructing/supporting clients with AIM and inspection systems. He worked with Shell Canada for 30 years in inspection, corrosion, major projects and process operations. He is a long-time member of NACE, the National Association of Corrosion Engineers.